Ever reach into the fridge to pour a glass of soda, only to discover that the bottle is flat? I have - and now I have a simple solution!!! You just inject new CO2 gas into the bottle to re-carbonate your soda. Sodas (Coke and Pepsi, Root Beer, etc) go flat because they loose their carbonation. The carbonation is lost because the CO2 that was originally disolved into the soda escaped into the air and all you need to do to make the soda not flat is re-inject carbonation back into your soda. The process is simple with the right tools - you just need a way to apply CO2 gas with enough pressure to force the CO2 back into the soda. And you really don't need that much pressure, just 40 pounds per sq inch (PSI) will do as long as the soda is cold when you try. 5. Remove the soda charging lid and put the original lid back onto the bottle after pouring yourself a glass of soda! It took longer to type these 5 steps than it takes to recharge a bottle of flat soda! Make your own soda - Don't buy an over priced SodaStream machine or pay for SodaStream's over-priced CO2 tanks! Instead formulate your own recipies, follow a family recipy for sassafras or root beer, or buy one of the hundreds of flavors available on the net for your own fresh soda. And when your soda is ready for carbonation just fill 2 liter bottles, chill, and carbonate with your own soda charger! Ever tried coffee soda or sweet tea soda? You won't find those flavors for sale at your local Wally World! Carbonate fruit Juice - I can tell you first hand that carbonated apple juice & carbonated grape juice tasts great! An all you have to do is transfer the juice into a clean 2 liter bottle, chill, carbonate and enjoy! Make your own Club Soda - My secret is to add 1/4 teaspoon of baking soda to 2 liters of filtered tap water, chill and carbonate. We've all done it, we have all thrown away too many 1/2 full 2 liter bottles of Coke or Pepsi because the bottle was flat. But it's easy to recharge a bottle of soda, all you need is a few tools to do the job. To start with, you will need a metal valve stem, the type with a screw-on nut. These disassmble into a handfull of small pieces that are easy to re-assemble into your 2 liter bottle cap. Don't bother with a rubber valve stem. Why? Because rubber valve stems are designed to be forced into a tire rim with a valve stem tool. And it's very difficult to force a rubber valve stem through a hole you just drilled through a 2 liter bottle cap. And if you want to use a rubber valve stem because you are worried about the metal in a metal valve stem, you need to know that the core of the rubber valve stem is still metal! Start by drilling a 1/2" hole in the center of your cap. I used a drill press but if you don't have one, flip the cap over and drill the hole from the bottom, through the cap and into a piece of scrap wood. Trim any excess plastic away from the hole. 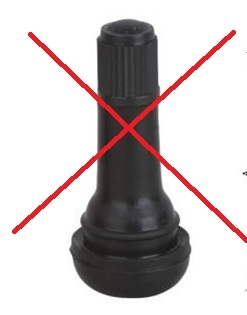 Remove the nut & top plate washer from the tire valve stem, but leave the bottom neoprene rubber seal in place. Your valve stem will look like the picture to the left. Insert the valve stem into the bottle cap. Install the washer then the nut and tighten with a 9/16" or adjustable wrench. Here is what the inside will look like when you are done. You can see that mine is not perfectly centered - it does not have to be as long as there is enough gap all the way around so that the lid will screw into your 2 liter bottle & seal. Put a thread sealer on the 1/4" Barb X 1/4" MPT fitting and assemble the air chuck (tire valve) & fitting together. We use LocTite Red thread sealer, you can also use Teflon Tape. Slide one end of the hose onto the air chuck assembly and the other end onto the CO2 Regulator outlet & secure with two hose clamps. We use oetiker ckamps but the screw style will also work. Attach the CO2 regulator to your CO2 tank. Turn the CO2 on by turning (opening) the tank valve all the way CCW. Adjust the regulator pressure to 40 PSI. You can leave the CO2 pressure set to 40 PSI and turn the CO2 off at the tank when you are not using the soda charger. Loosly screw your soda charging cap onto your bottle of flat soda. Squeeze the sides of your 2 liter together to remove as much air as possible then tighten the cap before releasing. Use your soda charger to fill the 2 liter bottle with CO2. Fill until the gas stops flowing. Shake the bottle to help the soda absorb the CO2 gas. Top off with CO2 until the gas stops flowing. Repeat these two steps until the soda will not absorb any more CO2. The remove the charging cap, pour yourself a glass of "fresh" soda, screw on the original cap & place in the fridge. Note: You should always remove the charging cap and put the original lid back onto your 2 liter soda before storing your soda in the fridge. Carbonated water is very corrosive and storing a 2 liter with your charging cap in place will dissolve some of the metal into your soda, giving your soda metallic taste. We sell a pre-assembled soda charging kit in our on-line store. The kit comes complete, as pictured to the left. You will need to supply your own CO2 tank.